What’s the Big Problem With Paper Pots? An efficient Japanese potting system has come under minor fire in the past year. What’s the deal? Say hello to the Paperpot system. The paperpot is a transplanting system, initially developed in Japan, that vastly decreases the amount of time it takes to transfer seedlings into the ground. It’s also become the subject of a strange controversy: can paperpots be used in organic farming? Developed by the Nippon Sugar Beet Manufacturing Company, paperpots have been in use for decades in Japan but only came over to the US about a decade ago, and currently have only one seller in this country. The system is basically a honeycombed piece of paper; soil is spread into each cell, a seed placed (with the aid of a Plexiglass system) into the cells, and the seeds grown to seedling. To transplant them, instead of moving by hand into the soil, you just use a simple push-truck to lay each seedling out in a line. It’s sort of hard to explain, so here’s a video. The paperpot system costs a bit to get started—you need to buy that push-truck and the seed-layer in addition to the actual paper, which cost between $2 and $4 each—but it can save vast amounts of time and energy in the transplanting process. The paper itself can’t really be reused, but it is compostable. 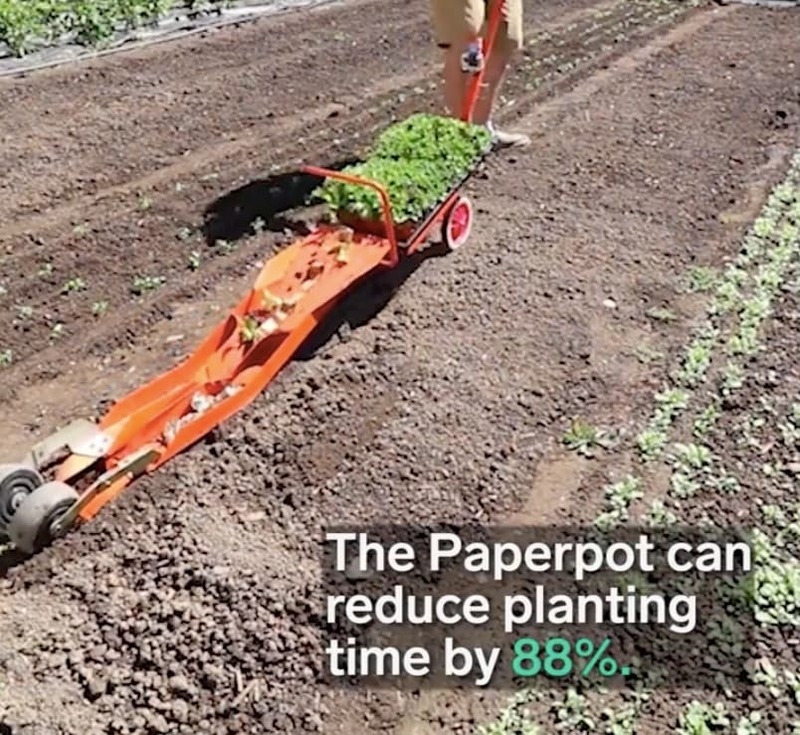 The ease of use and time saved has made the paperpot system fairly popular among small farms in the US. But for those small farmers who work to be certified USDA organic, there may be a problem with the paperpots. Back in March, the National Organic Program ruled that paperpots cannot be used in organic operations, due to the use of a type of acetate used in the adhesives in the paperpots. People were mad. Last week, though, Organic Insider reported a new ruling from the USDA: paperpots will be permitted until further notice. And that’s good for both small organic farmers who rely on the efficiency of the system and those of us who just find it soothing to watch the video of the seedlings being planted. Where can I buy one of these in the u.s.?